Lesson plans are easy to make with My School Year (Homeschool Record Keeping) from MySchoolYear.com. MySchoolYear is an online homeschool organizational tool to help make your homeschool run smoother and easier to plan. It can be used on your computer or your mobile device! With MySchoolYear, you are given the tools to help you organize and maintain organization in your homeschool. MySchoolYear automatically tracks attendance and class average when lessons are completed. The Teacher's Aid guides you in record keeping by asking you questions and helping you maintain records and continually tracking your children. 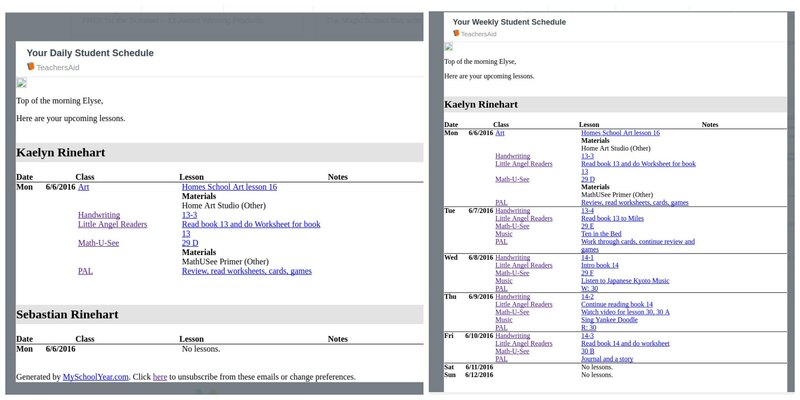 Everything can be easily tracked in MySchoolYear: awards, extra-curricular activites, volunteer hours, reading logs, events, and standardized tests. The Dashboard gives you easy access to everything that is going on in your homeschool. When creating lesson plans in bulk, the Create-A-Plan lesson generator eases the process and makes it quicker so that you are not stuck planning and typing for hours. There are also other ways to make lesson plans with a Rapid Repeat and Quick Split options. Rescheduling lessons are also easy with MySchoolYear. You can also copy and share lesson plans for easy planning. In addition to all the resources that you have with MySchoolYear, they also have toll-free and email support, secured access, and reliability. Their aren't any ads and you can count on a safe environment for you and your kids to use. Emails for daily and weekly schedule. How did I use MySchoolYear? For the last few weeks of school, I used MySchoolYear.com to plan our lessons. The first thing I had to do was set up the terms and I found out there wasn't much of a learning curve to the program. I was able to easily get use it to have your weekly and daily lessons emailed to me as a reminder. The Teacher's Aid asked me about awards and extra-curricular activities for the year, so I was able to easily add them. I didn't have to spend too much time working online to get things rolling for the remainder of the year and I could see the benefit of using this for next year's school year. Although I am a paper and pen kind of girl, I can see how MySchoolYear.com could be used successfully in a homeschool program. If my children were a little older, they could use this to help keep track of their own individual classes and activities. It was fairly easy to use and didn't require too much fooling around on the website to get things working the way I wanted them. I liked the weekly and daily digests as reminders of what we needed to accomplish that day. MySchoolYear wanted to be budget friendly with its price points. While they offer a free trial, they are an affordable option for families. I have been using the annual membership during the course of this review.